India has an active kayaking community (along with tons of epic rivers! ), bolstered recently by its two major kayak festivals: Ganga Kayak Festival and Malabar River Festival. But our community has not yet matured toward standardization. Sure, there are safety and first aid courses that paddlers can take, but for instructing and guiding, there is no standard of instructor-level requirements, allowing each instructor to determine his* own way of teaching both on and off the river. Anvesh Singh Thapa is the founder and owner of Expeditions India. 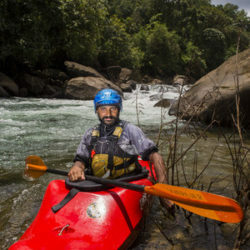 He has been rafting and kayaking throughout the world for the past 20 years, making him one of the most skilled and experienced river guides in India today.